We chose six well-reviewed gelaterias of lower Manhattan and proceeded to visit each one over the course of an afternoon. We attempted to taste the same flavors throughout the tour. It was a nice walk for a beautiful day. When people visiting want dessert, you need to show off Manhattan at its best. Knowledge is power. It comes down to three factors: fat, air, and serving temperature. If you’re interested in the details, check out Serious Eats. What you need to know is that ice cream is more milky, while gelato is more sugary. It’s also tougher to make good mass market gelato, and gelato melts at a higher temperature than ice cream, so don’t take your time with it. This wasn’t a great idea. Your stomach will take a full day to forgive you. They use high quality ingredients to craft their flavors (notice the brown colored pistachio), which are rich, flavorful, and creamy. You can put as many flavors as you like in any size. If you choose a cone, they will craft into the shape of a flower for you (that being said, their flower cone kung fu is weak compared to the tight and perfect flower cones served at Gelatro Rosa in Budapest). Pistachio is a quality canary. It should be a very light green or brownish color. We’d learned this before the start of the tour and were pleased not to encounter this use of food coloring at any of our gelato stops. You don’t want the fake the stuff, and even if you don’t like pistachio, fake ingredients in one gelato is an indicator of poor quality ingredients in the other flavors. The gelato here is sweeter than all the others, the stracciatella has a stronger flavor, and most importantly, the pistachio takes the cake. They also offer a wonderful gelato cooking class with their chef (it’s where we picked up a lot of our gelato knowledge). Gelato is a specialty food. Making it properly requires thousands of dollars in gelato-specific equipment, and a ton of knowledge. It also needs to be made and served fresh daily. Get your gelato at a gelateria, not at a corner store, and not a restaurant, no matter how much you enjoy their savory appetizers, such as we found at Otto Enoteca Pizzeria. As long as you don’t need a place to sit and you can stand to wait in line, L’arte del gelato has a solid product. They don’t have all the classic flavors there, but the ones they have are creamy and flavorful. This wasn’t a favorite, but it was a solid choice. This is another quality canary. The part of the banana that you eat isn’t bright yellow. The only reason for a banana gelato to be yellow is because it has food coloring and probably artificial flavoring. If you’re down near Katz’s with a hankering for something different, it’s a solid choice, although you’ll feel really small standing in that huge space without many tables. But don’t go out of your way to get there. Grom is a hugely hyped gelato joint, and it was a bit of a letdown. We almost forgot to write about it. The thing is, they do things right. They use proper ingredients, and equipment. They know what they are doing too… It just don’t taste that great. Especially when compared with Amorino, which is maybe a 10 minute walk away. The following things are not standard: size of scoops, amount of scoops per container, layout of scoops within a container, and willingness of the person scooping for put more flavors in your container. But the bottom line is, if you want four flavors to share amongst a group, you’re looking at $8-10 total (not per-person). A smaller adult portion will run you about $6.00. Ordering a larger portion and sharing is a good deal. These two stood out as the decisive winners of NYC Gelatofest 2014. Hi there. I wanna know where you took this picture in number 2. I bought a gelato in Budapest on August 2015 and swear that is my picture that I took. It is totally my thumb in there. I posted it on my Facebook and now it’s gone. Just wondering whether or not that’s my pic. I’ve been to that place in Budapest too! 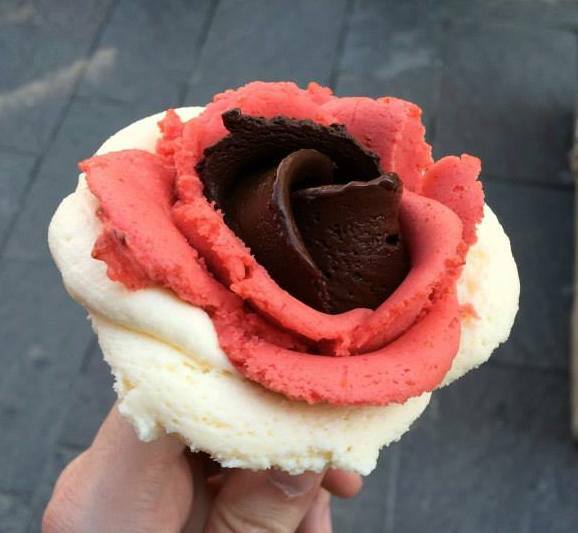 Amorino in NYC also assembles their cones as roses.